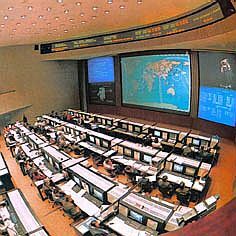 The Mission Control Center of TsNIIMash at Korolev, Moscow region. The Central Research Institute for Machine Building (Russian acronym TsNIIMash) is the leading institute of the Russian Aeronautics and Space Agency Rosaviacosmos involved in the development of rocket and space technology. TsNIIMash (originally designated NII 88) was established in May 1946 as a main research design and production organization specializing in the development of long range ballistic missiles, air defense missiles and their propulsion units. TsNIIMash is today involved in the design and exploratory research to substantiate a reasonable engineering policy in the development of rocket and space technology. It is involved in fundamental and applied research in aerogasdynamics, heat transfer and thermal protection, dynamics, strength and reliability of launch vehicles, spacecraft, orbital stations and space vehicles and last but not least it ensures the control of manned spacecraft orbital stations and research and commercial space vehicles. Many space professionals are looking forward to further space exploration using electric thrusters (ET). Unlike ordinary chemical propulsion systems, ET demonstrate much more higher exhaust velocity, since the propellant is accelerated for propulsion by electric power being supplied from an onboard source. The thrust produced by ET is very small - not more then a few gramms so that ET cannot burst a rocket from the Earth surface. ET can tick only on board any orbiting satellite or spaceship. The high exhaust velocity distinguished by ET offers noticeable propellant saving for given maneuver in space as compared to chemical propulsion so that mass reduction of a communication satellite for instance may be up to a few hundreds kilos. As a result this more lightweight satellite could be lifted in orbit by less heavy launch vehicle saving millions of dollars. 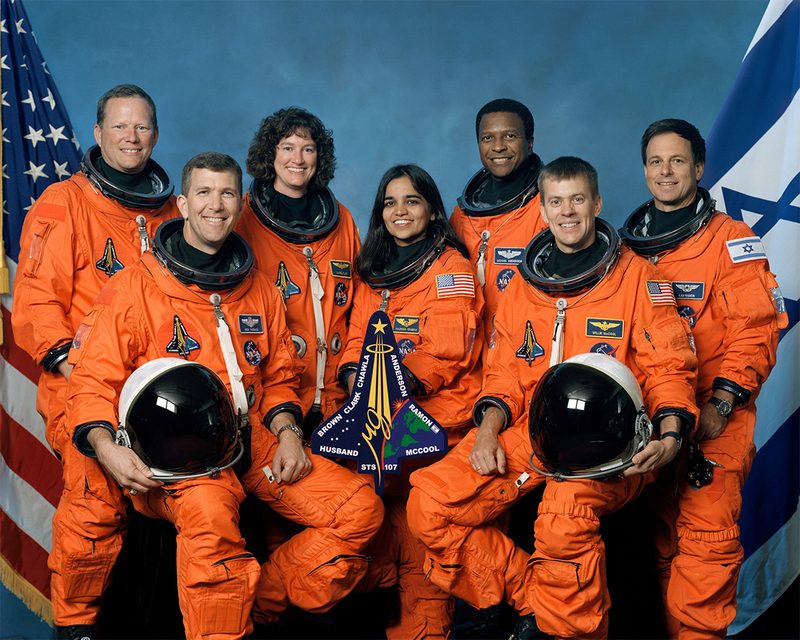 The seven members of Columbia crew. Sit down at foreground are astronauts Rick D. Husband (left), mission commander; Kalpana Chawla, mission specialist; and William C. McCool, pilot. 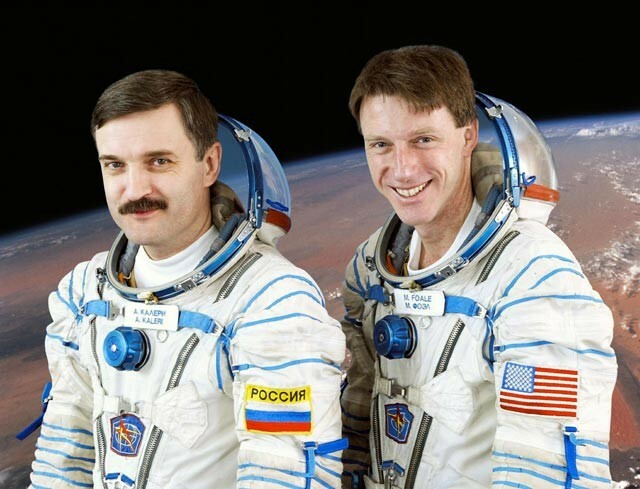 Stand up (form left) are astronauts David M. Brown, Laurel B. Clark, and Michael P. Anderson, all mission specialists; and Ilan Ramon, load specialist representing Israel Space Agency, ISA. However money saving is not the only profit. A less heavy rocket is less hazardous for environment. ET themselves are ecologically pure using as non-detrimental propellants as noble gases, hydrogen, ammonia. The benefit of electric propulsion will be more fully realized when significant cargo traffic arises in space providing deployment of large space structures, colonization of the Moon and planet exploration. That is why ET are included in such ambitious projects currently under development as Electric Orbit Transfer Vehicle, Lunar Ferry and some unmanned mission to planet. Over these projects the flight use of ET would save hundreds millions of dollars with better ecology. Currently we are present at the beginning of the "gold century" of electric propulsion. To make it reality the electric propulsion community in many countries is going on with research and development of ET of different types either for secondary on-orbit application or for primary propulsion of multikilowatt level. 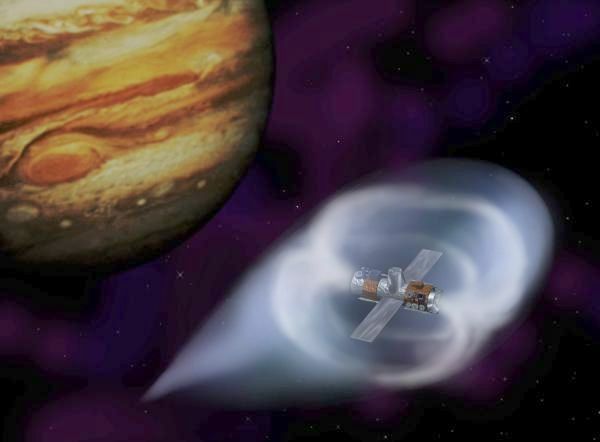 In the future the electric propulsion (plasma or ionic engine) could drive a space probe like we already did with the Deep Space-1 probes and recently sending SMART-1 to the Moon and some others. At left an experiment showing a luminous plasma plume inflating an invisible magnetic bubble inside the vacuum chamber at NASA's Marshall Space Flight Center. At right charged particles in the solar wind hit the electromagnetic bubble surrouding a spacecraft, apply pressure, and propel it. 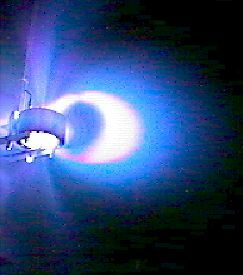 This mini-magnetospheric plasma propulsion is called M2P2 for short. A 15 km-wide miniature magnetosphere one astronomical unit from the Sun would feel 1 to 3 Newtons of force from the solar wind. According NASA engineers that is enough to accelerate a 200 kg spacecraft from a dead stop to 80 km/s (288000 km/h) in only 3 months ! However what is a place of radio amateurs in the matter ? VHF-community could play its role in ET implementation if wants. Integration of ET with onboard equipment poses a certain set of problems to be solved such as electromagnetic compatibility of ET. Particularly the matter is that highly ionized exhaust plumes of ET may scatter RF-signals producing large "dead" zone for communications. This plasma screening effect should be thoroughly studied before electric thrusters become standard onboard equipment. The investigation will help designers of future electrically propelled spacecrafts to minimize the hazard of communication disruption by ET plasma plumes. If the history of the electric engine goes back to several decade, the discover of the "dead" zone around the plasma engine is quite new. Fligh-designed alkaline plasma injectors EPICURE. 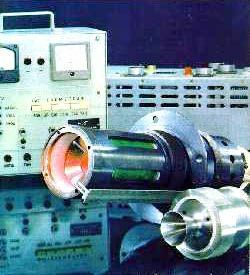 In 1987 specialists of Central Research Institute of Machine Building (TsNIIMash) conducted a series of space plasma experiments in order to evaluate the shape of mentioned above "dead" zone using KOSMOS satellites with onboard arcjet plasma source EPICURE. 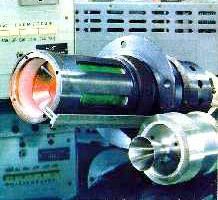 The well known method of radio sounding was used for plasma monitoring. The telemetric and command signals emitted by onboard antennas played a role of sounding signals. Passed through plasma these signals were simultaneously received by a number of on-ground measuring sites. The shadow effect was clearly observed however the precise data on the shadow boundary shape and its dynamics could not be obtained in the experiments of 1987 since the receiving network was too rarefied. Deployment of properly dense special receiving network is extremely expensive and consequently unrealistic. Therefore the project director thought using the world network of hams. 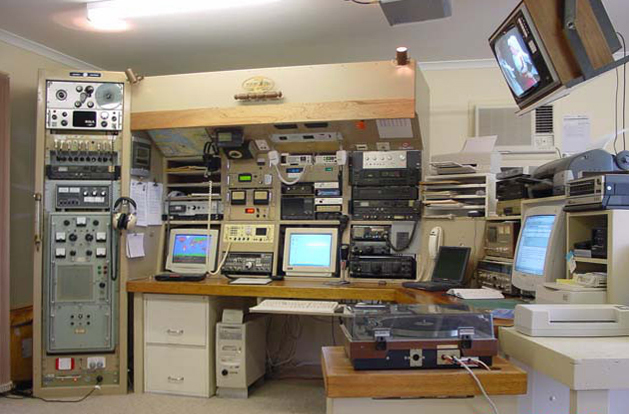 Possible solution is to use available worldwide spread network of amateur working with VHF receivers. This idea was put in the base of an proposal to perform a new plasma space experiment on the International Space Station (ISS) almost in the same layout as in 1987. Onboard beacon operators should be the ones from the ISS crew transmitting a sounding signal (the onboard beacon), while the on-ground receiving network operators should be represented by a network constituted of amateur radio like YOU ! Except the scientific data, realization of the space experiment "Shadow" will give an unique experience in involving intellectual and technical potential of the international radio amateur community as well as Internet technology and resources for monitoring of the near-Earth space and to evaluate capability to use this potential in perspective scientific projects. Methodologically SpEx "Shadow" is oriented to using of amateur packet radio and Internet technology and resources. The objectives of the work is observation and evaluation of refraction/scattering effects in artificial plasmas using method of RF sounding in space experiments under different geophysical conditions. In the chosen region the onboard arcjet source injects a plasma plume in space and the onboard radio beacon transmits VHF sounding signals in the form of the Universal Time Marks. Passed through the plasma these signals are being instantly received by an on-ground measuring VHF network. Due to refraction/scattering of the sounding signals in the exhaust plume, the shadow region would arise adjacent to the satellite. 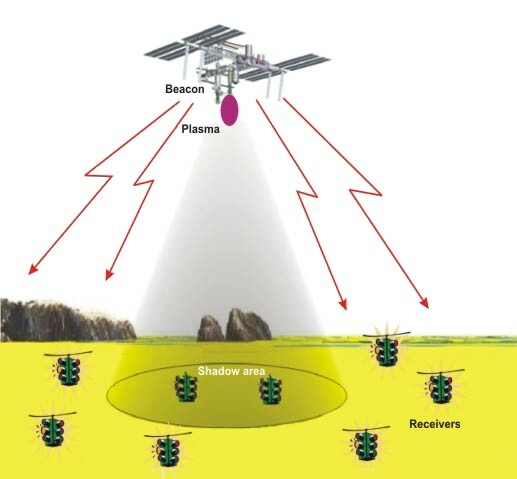 When the shadow boundary running after the satellite along the Earth surface reaches any on-ground receiving site the signal cut-off is to be registered. At left the SpEx "Shadow" lay out. At right the "dead" zone over the USA when the plasma plume is exhausted. The task of every individual participant is to register moments of signal cut-off and following signal restore using the Universal Time marks and to address this information along with data on its geographical position to the Information Storing Center. Every operation sequence would take 6-8 min. while the satellite is passing between two opposite points of the local radio horizon. It is interesting to perform the experiment in different geophysical conditions particularly while flying over Europe (including the former USSR), Japan, North America, Australia and some other regions where we will be lucky to manage a receiving network dense enough. For an example the previous image shows the expected borders of a radioshadow for the North American measuring field. The amateur packet radio technology in the SpEx "Shadow" as proposed by astronaut Alexander Kalery, alias U8MIR offers the possibility to use Internet transport resources either for net-work notification or for data collection. Principally the available receiving network may be provided with Universal Time Marks if the onboard radio beacon merely transmits packets of minimal duration in format of AX.25 Protocol. This promises to perform large-scale monitoring of an artificial plasma nonhomogeneity using the mosaics of on-ground receiving sites. When amateurs and professionals work together. 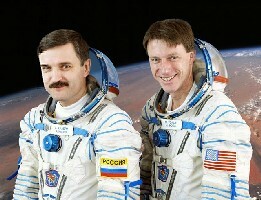 At left Alexander Kalery, alias U8MIR and Mike Foale, alias KB5UAC joining ISS crew in 2003. At right Tony Hutchison, alias VK5ZAI radioshack showing at center the FT-736R transceiver to work satellites including ISS by voice, and at right the packet radio installation (blue screen showing a receiver). It takes advantage of the WinRADIO WR-1550i radio card, one of the first DRM receiver available on the market covering frequencies between 150 kHz and 1.5 GHz in all modes. Roger ISS, downlink open ! The same technology can be also applied in space experiment on sounding of not artificially injected plasma, but of the natural ionospheric plasma in HF frequency band (14 MHz). 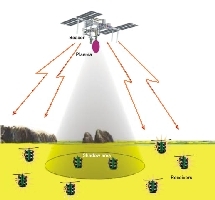 It is expected, that due to dispersion of sounding radiation in ionospheric plasma, an "irradiated" spot should appear on the Earth surface, and determination of boundaries of this "irradiated" spot is the purpose of space experiment (legend "Spot"), which can be carried out not necessarily on the ISS. The scientific results the SpEx "Shadow" will help designers of future electrically propelled spacecrafts to minimize the hazard of communication disruption by ET plasma plumes. Except the scientific issues, realization of the space experiment "Shadow" will give an unique experience in involving of intellectual and technical potential of International radio amateur community as well as Internet technology and resources for monitoring of the near-Earth space and to evaluate capability to use this potential in perspective scientific projects. Actually the space experiment "Shadow" is an interesting attempt to use Internet for principally new goal - not only for information spreading but also as an effective measuring tool in spatially large-scale scientific researches. The space experiment "Shadow" may also bring an important social result attracting public attention to advanced technology, astronautics, amateur packet radio and Internet. With really mass, voluntary and gratuitous participation of VHF-amateurs this project would become a humanitarian world wide action uniting many peoples of different countries with interesting and useful work for future enhancing the spirit of cooperation, mutual understanding and friendship. As it was mentioned above the space experiment "Shadow" may be successfully performed under the condition that the number of participants will be great enough . The greater this number the more precise scientific result would be issued. As claims for participation in the SpEx "Shadow" appear at the Information Storing Center in response to this initial invitation, we are going to select perspective "measuring fields" where the receiving network is dense enough and where the bulk of activity will be further concentrated. - of full scale "hot" (with plasma injection) experiments. Being lucky and fast in managing of the receiving network, we may begin the "cold" stage probably this year on the International Space Station. After successful fulfillment of the "cold" training phase it will be possible to accept the justified solution on realization of a series of full scale "hot" experiments probably an year later. Participating in this experiment is easy and I encourage all VHF licensed hams to subscribe. You need a V/UHF transceiver and any kind of V/UHF antenna, from the 23 elements with preamp and rotator to the simple whip antenna. Optionaly, in the same time you can made voice contact with the crew on ISS using a QRP power as small as 5 watt (i.e. using a hand held VHF radio Alinco DJ-V5 about the size of a packet of cigarettes !). Note that you do not need an emitter for on-ground operations, the project leader requesting only a report using a time stamp on the received signal (see below). SWLs and all amateurs fan of shortwaves can also take part in this project using a simple V/UHF receiver (including WinRADIO cards) or a scanner fixed on the frequency of 145.800 MHz. Other frequencies are at your disposal on UHF and higher bands. Contact Valentin Strashinski for detail. Then you need a computer to decode the packet radio and a tracking software like WXTrack or Nova for Windows with the last Keplerian data file. 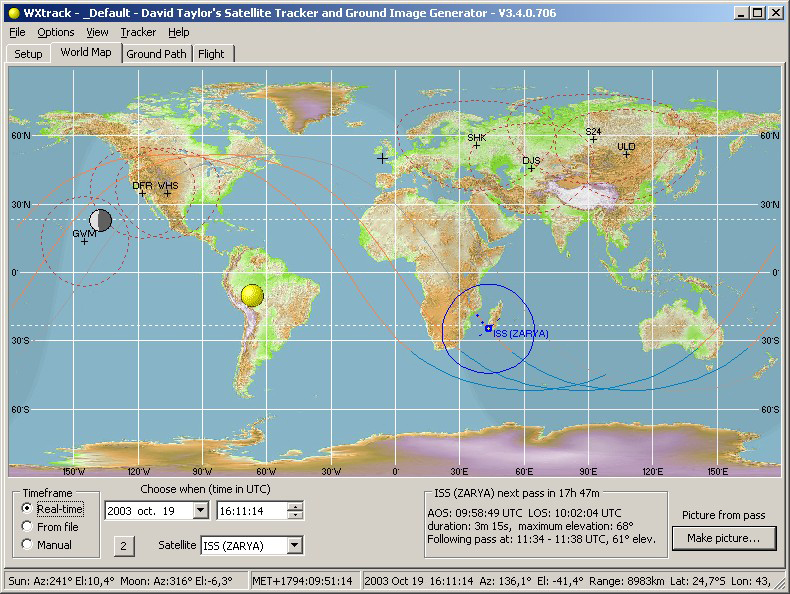 This software will give you the location of the Space Station in real-time, and optionaly will allow you to track its move if you use a directive antenna with a rotator. If you simply use a ground plane vertical or a whip antenna the rotator is useless. The speed of the packet you are listening for is only 1200 baud. To know what they sound like when trying to find it on a receiver here is an audio sample of packet radio bursts. A document prepared by VK3UKF (.wav of 118 KB). In order than your computer decodes the packet radio you need to download 3 programs : the AGW software, its FITS driver, and UISS communication software. Install all them in your computer. UISS will not work if AGW is not running. Practically AGW sends information to the UISS program using the FITS driver. The UISS communication software should be registered with Guy Roels, alias ON1DHT to enable all allowable functions. He requests only a photo of yourself for identification to send him by email. This software is called a cardware instead of a shareware and it is free of charge. If you don't like UISS you can use the monitor program provided in the AGW Packet Engine. 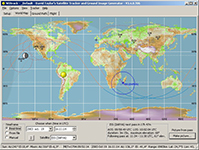 The idea of using a program to capture individuals packets of data emitted by ISS allows to each one of them to get a time stamp. Your log must be then sent to your national co-ordinator by email or directly to Valentin Strashinski. After this the project leader could plot these data on a map to analyze the signals extinction and trace the "dead" zones along the ISS path in the different ET configurations. Please, do not put this action off since your claim may support the official decision on the SpEx "Shadow" performing as a proof that amateur receiving network could actually be formed and activated. At last, for the good news,Rosaviakosmos is going to award every participant of the space experiment "Shadow" with special diploma. NB. End 2005, KGB put in jail three leading academics from TsNIIMash (Here is an English news about this). According to FSB, they exported secret material to China. But according to ESISC, this material could not serve military purposes. In all cases, between end 2007 and 2008, the TsNIIMash web site was closed. Good news, since 2008 Valentin Strashinski works again on the ET Shadow project. A summary of this article was published on QRZ.ru.